more tips here http://paramountfurniture.com/?p=25821 On the Psychedelic Side of Trance,TFI talks with Sonic Species,an exlusive Surprise Interview for our Fans. Having performed repeatedly at many of the leading international events, the signature Sonic Species sound is now blasting loud in all four corners of the globe.Sonic Species and Avalon have also joined forces to venture into the world of Progressive Psy Trance with their new collaboration project – Future Frequency. With a debut album planned for release on Nano Records in 2015, the next year is heating up already! PsyTrance has got a boon ever since the Mr. Generation X started UNLEASHING across the Globe! We at Trance for Infinity from India are overwhelmed for the opportunity to have you with us the Prime Producer, DJ aka Sonic Species. Great to have you Joe Markendale! >Wow! It’s great to be back in the hot seat and connect with all the Trance Heads in India once again! 01. Sonic sounds from the species are the ones that produce immense vibrating sounds and make the Earth go Dancing! How did the process begin? 02. Back to back stomper gigs, playing at the BIGGEST of heavyweight festivals and teleporting across the globe… what’s your favourite summer festival? I must say Boom and Ozora are the most inspiring and intensely radical festivals to play! You can feel the magic in the air when you drop that beat and you can see the people losing their minds like it’s their last day on earth. The experience people have with sound in these festivals is nothing short of incredible! 03. You have conquered the World’s gargantuan label industry Giants! Be it the ones namely; Nano, Hommega, Digital Om Productions, Alchemy, TIP Records, and loads more. We have also seen that by time the quality and psychedelic sounds have been getting better and better, what has been the inspiration? My inspiration comes direct from the dance floor. Every week I play to a different crowd in a different country and every week I see people having amazing dance experiences to Psytrance. All it takes is for me to see 1 person reaching that ultimate dance moment during my set and I am fully inspired to go back in the studio and produce the next wave of Sonic Species music! 04. How important is influence of Goa Trance in terms of the entire spectrum of Psychedelic sounds? For me Goa trance was a really important part of my journey into Trance. I used to listen in the beginning to Transwave, Astral Projection, Cosmosis and Hallucinogen and that would make us go wild. This was brilliant because when I started attending some cutting edge underground parties I had a very nice surprise to hear that the music was evolving and the transition from Goa to Psy was underway. The baselines were becoming massive and the grooves were changing…Wow what an Epic time in Trance that was! Those days still are one of my main sources of inspiration when it comes to producing cutting edge dance music. 05. Sonic Species has played alongside with the monks of PsyTrance DJs and also you have been making music, remixing for them and so for the new talents. Tell us Joe, how you manage shifting the transitions to each of them while maintaining the originality of Sonic Species in that track.? 06. What has been your hardware wardrobe like? it swings from Virus TI, Dynaudio BM6 Mk1, to RME. 07. What do you think is the current Dance music scenario for Psy? Is it turning out to be more bigger and acceptable verses those earlier days of being niche musical genre? What’s your take on this? I think that Psytrance is definitely becoming more widely accepted in the larger dance music scene across the planet. We now work more than ever with artist from other Genres and this along with high quality events such as Boom Festival show the world that we are no longer a tiny scene buried underneath other genres…We are a fully international scene with some of the highest level of production for music and events, sound and visuals in dance music. Personally I believe in the power of Psytrance to change people’s lives in a positive way so I sincerely hope that our wonderful scene keeps on growing and attracting fresh people to experience the madness!! 08. We want to know what the latest incoming from you is. Please enlighten with some insights of Collabration albums, remixes, new acid loops in the studio? Up next I have a collaboration track coming out as a Single on the new powerhouse record label Sacred Technology! The track is a thundering 138 high energy piece called Alme Libre and will be coming out this side of X-mas. Other than that I have a collaboration with the Outsiders that’s almost finished so that will follow. Finally the Sonic Species Rmx Album is underway so get ready to be blasted in 2016 with a string of remixes from top artists on the scene! 09. 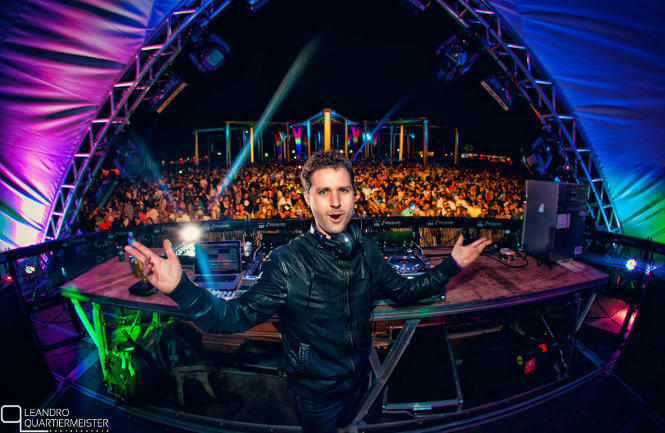 We at Trance for Infinity & friends have seen you in India with all your multi-city tours being a constant hit! When can we see you again? My next India adventure will be in February 2016. I’ll be doing a multi-city tour as well as performing at the legendary Hilltop Festival in Goa! I cannot wait to return to India, I’m very excited indeed! Word of thanks: – Thank You Joe, It’s been more than a privilege feel to have you for this interview, we hope the “Sonic Species” continue to keep the musical connection active and radiate in the cosmic universe to make the Species DANCE to the sonic sounds! All the best for your future ventures. Big love from TFI & Psyfamily, India.